We are delighted to see a ventriloquist on board, and with a soundtrack of Billy Joel floating through the movie, what could possibly go wrong? Passengers are advised to make certain they are decked out in proper apparel. No burkinis, s’il vous plait. ESSENTIALS FOR A BEAR, LAID BARE; WAIT, WHAT? YES, BUT WILL I FIND ANY RARE POKEMONS THERE? What tales to share with the grandchildren! What fun we had, putting with the “native residents” upon artificial greens! OK, enough already with with the Debbie Downer doom and gloom: we have an appointment to have our every whim catered for, poolside. Properly attired, bien sûr! Not to worry, though; climate change is yesterday’s news, old hat. Best to ignore the Doom & Gloomers and focus on something more positive: though the viability of the entire species may be in question, as individuals we can live forever! Longevity is fully capitalized; immortality incorporated. For those able to pay the price, aging will soon become a thing of the past. Isn’t that exciting? Severing ourselves from the “free gift from nowhere”, we make this deadly trade as one final embodiment of hubris amidst the furies of our own collective disappearance. Wealthy humans shall achieve an indefinitely extended longevity in exactly the same blink of geological time when the rare and fragile ecological conditions that sustain homo sapiens recede back into the mysterious infinity of the cosmos. Such are the perverse divergences of our possessed rebellion. 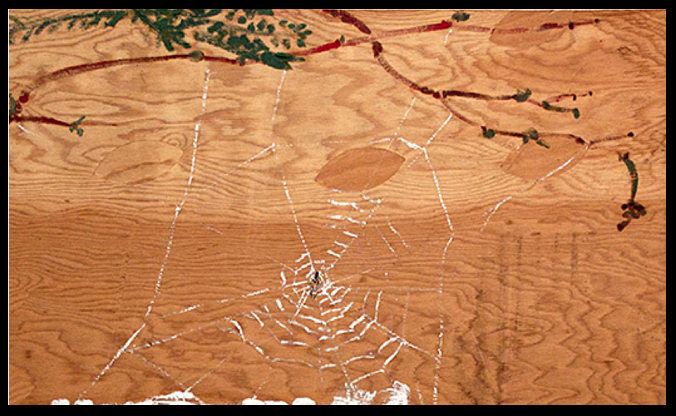 Below, a detail from a painting by Bill Lynch, Caught in the Spider Web.